Upgrade the look and feel of your home with this contemporary sofa, which is equipped with all the latest features in motion technology. From the power adjustable headrests to the built-in USB ports in the power reclining mechanisms, this piece has everything you need. 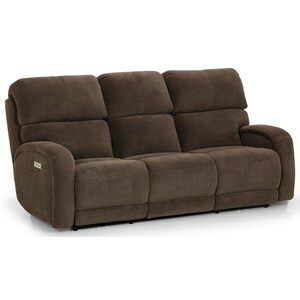 The Laurel Contemporary Power Recliner Sofa by Steve Silver at Sadler's Home Furnishings in the Anchorage, Fairbanks, Sterling, Alaska area. Product availability may vary. Contact us for the most current availability on this product. 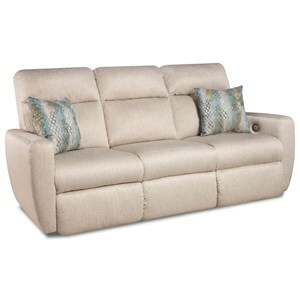 Fabric Content Top-grain leather on all seating areas and polyurethane sides and backs. Recliner Mechanism Power articulating headrest and power footrest with USB port and home button to return seat and headrest to original position. 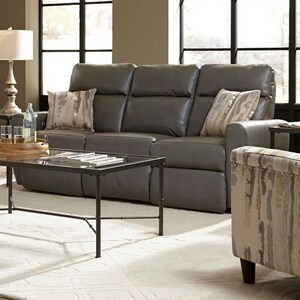 With its top-grain leather and upgraded technology, this reclining living room collection will bring a high-quality look and feel to your home. The Laurel collection is a great option if you are looking for Contemporary furniture in the Anchorage, Fairbanks, Sterling, Alaska area. 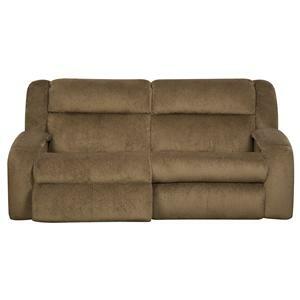 Browse other items in the Laurel collection from Sadler's Home Furnishings in the Anchorage, Fairbanks, Sterling, Alaska area.